On most any Iowa City weekend, cabbies lurk around the downtown bar scene as college students stumble out of places like Sports Column or Joe’s Place looking for the nearest cab. Usually, students don’t notice if lettering is missing from the cab’s side, whether ceiling fabric is torn or deteriorating or if the driver’s identification card is posted. Nor will they stop – as they pile in – to ponder whether they are stepping into danger. Earlier this year, three women reported that Iowa City drivers — two from unmarked cabs — made unwanted sexual advances, and police are investigating. The assaults show another form of danger haunting weekends in home to the University of Iowa when alcohol flows and carefree moments make students easy marks. Many city officials agree that changes to taxi regulations would reduce chances that a cab ride will end in tragedy. “Our ordinances haven’t kept up with the sheer number of people engaged in this business,” Derek Frank, the Iowa City Police Department’s neighborhood response officer, said. The city licenses between 200 and 300 drivers annually. Samantha Stephan spent several hours on different nights earlier this year riding with and observing Iowa City Police Officer Derek Frank and Marco’s Taxi Co. driver Jim Calloway to report this story. Partly in response to concern about assaults, the Iowa City Council made minor changes in cab regulations, such as authorizing the city to suspend drivers’ licenses if they aren’t obeying rules and requiring drivers to keep trip logs for 60 days and give notice when license plate numbers are changed. Mayor Matt Hayek said the assault investigation is a primary concern for council. City Clerk Marian Karr said the city is looking at other taxi regulation models. “Just because it worked here once doesn’t mean it needs tweaking. Maybe it needs total rewriting,” she said. In March, Iowa City police arrested Rufino Ruiz, 58, of West Liberty, on two counts of simple assault alleging he made unwarranted sexual advances, including groping, against two passengers while operating as a VinaSun Taxicab driver. Police say the assaults were made on Sept. 29 and Jan. 15. VinaSun owner Son Minh Nguyen said Ruiz has quit. Ruiz is not listed in city records as an authorized taxi driver. Police also are investigating whether or not two other drivers sexually assaulted riders earlier this year. One of the riders identified American Taxicab, police records show, but owner Adil Adams said he’s 100 percent confident his drivers aren’t responsible. Existing city law provides some protections. Drivers must provide certified driving records and criminal background checks by the Department of Criminal Investigation, which are attached to their applications and signed by Iowa City Police Chief Sam Hargadine. The city’s equipment division inspects each vehicle, and a certified calibrator relying on the company’s rate card installs the rates in meters. Karr then issues a decal for the year, which runs June 1 to May 31. Yellow circular decals, which are to be changed to purple in June, are fixed on passenger-side window to verify the driver is licensed. 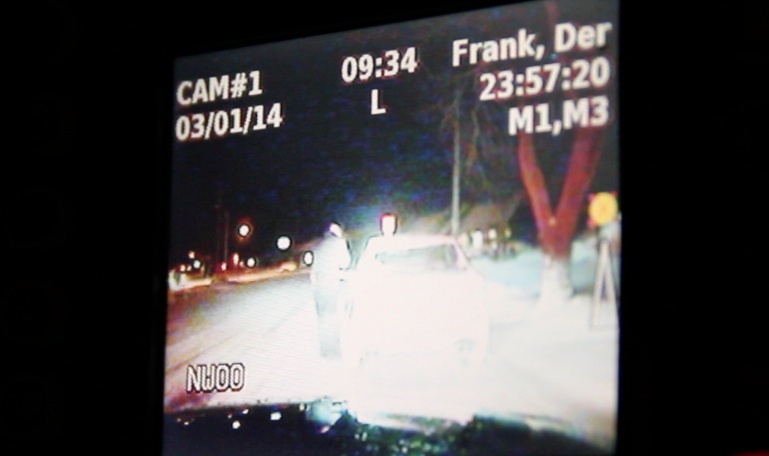 Iowa City Police Officer Derek Frank in his squad car in early March 2014. Frank, the response officer, conducts routine stops to monitor taxis. Occasionally, he spots cabs with no company identity or drivers with unauthorized decals on the vehicle picking up passengers. In late March he stopped Sam Kennen, 40, previous co-owner of Pink’s Taxi, and gave Kennen a warning alleging he was operating an unauthorized cab. Kennen was not working for a licensed company. Rather, he was giving rides to students he previously had given rides, Frank said. He was using a plain, white minivan carrying four women, all college students, the night he was stopped. Frank made the women get out. Sometimes students report suspicious cabs, as did UI senior Claire Spellman, 21, on March 8 while with two friends downtown. They approached two officers in a vehicle near the restaurant and asked which cabs in Iowa City were safe, but felt that the officers were not helpful, Spellman said. On March 1, UI freshman Colin Smith, 21, sat in the back of a cab with five other UI students while Frank issued the driver, Nikita Kaim, 40, a ticket alleging he was not displaying an identification card while driving. Tom Moore, university spokesperson, said the UI assists city staff upon request in ongoing investigations. Frank said he plans to meet university personnel to talk about distributing prevention pamphlets. Hayek said he believes the city has regulated taxi companies effectively but that people should be better educated before getting into a cab about laws that protect them, such as license requirements. Frank agreed, adding education is good for the drivers, too. 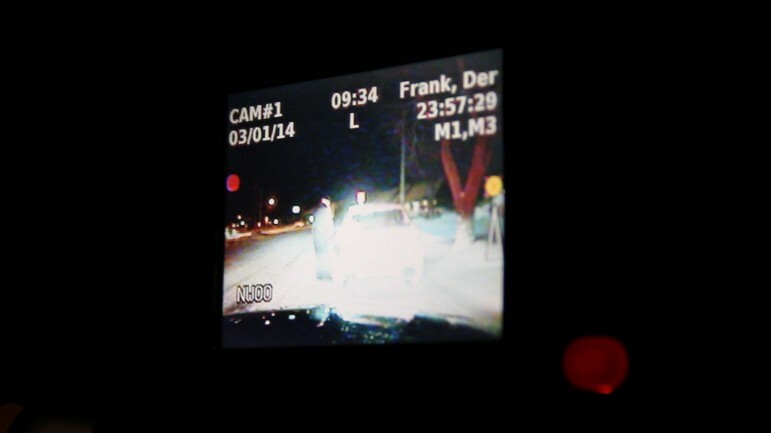 Iowa City Police Officer Derek Frank stops a taxicab driver in downtown Iowa City the night of March 1, 2014. This photo shows the image produced by a video camera that is taping the stop. Frank said companies using independent contractors should hold drivers accountable because educating drivers about their accountability is the top taxi-related problem police face. Company owners using contractors, who pay to use the company name, often aren’t as involved as companies who hire their own drivers with the drivers’ whereabouts, habits or actions, he said. Some companies, such as Marco’s Taxicab Co. or Yellow Cab, operate under traditional employer/employee models, in which drivers operate company vehicles. The city does not regulate individual drivers, even though it issues their licenses. “What we do is give drivers the ability to go on the authorized list and work for whomever,” Karr said. For owner/driver relationships to work properly, owners must relay ordinance information to employees, she said. That’s what cab driver Nikita Kaim said when pulled over around 3 a.m. on March 2 for not displaying an identification card. Kaim previously had worked for a different company, and that company had provided identification cards to drivers, he told Frank. Kaim said he had asked his current company about the cards, but it didn’t distribute them. Adams, the American Taxicab owner, blames the accountability problem on the city, saying it doesn’t adequately educate drivers. He strongly urges the city to review its ordinances and better educate drivers. Taxi company owners and city staff meet annually for one hour to review the ordinances and regulations. Adams said these sessions don’t help much and that drivers and owners would appreciate a more extensive taxi course. Company owners should make daily or weekly check-ups on their drivers and ensure the drivers understand the ordinances, Karr said. Some drivers oppose more regulation. Kevan Allison, independent owner-operator of Kev’s Cab, said it would drive out every small taxi business. “It’s socialism,” he said. Allison said he cannot drive much longer because of expenses imposed on taxi drivers by city law. For example, he said smaller cab companies face high insurance costs; his monthly premium is $500. Regulations serve a public need, Frank countered. “If you can’t afford … to make driving a safe environment or have some sort of accountability, then maybe you shouldn’t be in this business,” he said. One way police hold drivers accountable is with a sting. Conducted every three to four months, officers dress normally and catch rides to see if drivers are in compliance. They check whether taxis use meters, provide safe service, charge what the meters show, or violate other regulations. Marcos Taxicab driver Jim Calloway displays a makeshift taxi identification card at the front of a cab he is driving April 7. This is all Iowa City requires for driver identification. During stings, officers have become suspicious of the appearance of some company-issued identification cards, like a half piece of notebook paper with the names of the driver and company. Until a year ago the city issued identification cards. Now, companies can fashion their own with simple requirements: be visible to all passengers and be at least 8½-by-5½ inches. 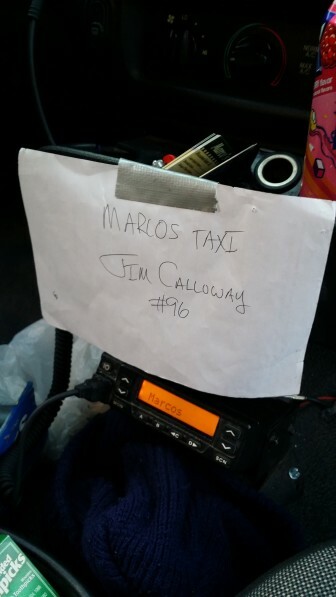 For Jim Calloway, a Marco’s Taxicab Co. driver, identification cards are essential to a company’s legitimacy. “One of our night drivers actually put a picture of himself on it, and, so it didn’t look like a third grader did it,” Calloway said. Karr said the city stopped distributing cards, because they hindered drivers’ ability to work with more than one company, and many companies wanted their own cards for marketing. Whatever additional regulations emerge for Iowa City taxis, City Council member Jim Throgmorton said they should be regional in scope in a regional transportation system and be administered by someone other than city clerks. “When you think about it, from a transportation point of view, what does the city clerk’s office know about transportation?” Throgmorton said. Council member Kingsley Botchway II said regionalizing taxi driving should be considered at some point, but the council first should focus on regulating driving rates and lowering fares. Regionalization would make regulations identical with Coralville, North Liberty and other cities in Johnson County. Iowa City Manager Tom Markus said he plans conversations with Chris O’Brien, the city’s transportation services director, about regional taxi transport. Karr said council members plan to review UI graduate student Michael Saporano’s 2013 master’s thesis, “Economic regulation in the taxicab industry: a case study of Iowa City, Iowa.” It analyzes the benefits of gradual deregulation, saying it would help small firms, drivers and riders and compliment broader city goals. The council is to examine it in terms of potentially integrating taxis into a regional transportation system, Karr said. The Des Moines Register and The Gazette (Cedar Rapids, IA) published this story. Samantha Stephan is a student who originally wrote this story for a class taught by IowaWatch co-founder Stephen Berry at the University of Iowa School of Journalism and Mass Communication. IowaWatch trains college students to do investigative and community journalism in an in-depth, ethical manner.